Rooftop battle at the end of movie 1. Followed closely by that hilarious scene in TMNT 3 when Casey shows the Japanese guards hockey on TV. Actually my favourite part of that is later on when one of the guards decides to take the TV with him back in time but Casey stops him. That part too. Classic. I laugh every time I watch it, never gets old. "And then I'm going to be rich! Like - stupid rich." If only the movie had more moments like that that y'know were actually funny. "Ah, the rat. So it has a name. It had a name!" That was a crime, you purse grabbinnnnn puuuuuuukes! Casey Jones massaging April's shoulders. I wish it was longer, looks therapeutic. Raphael- (bringing April in) I dunno Leo I wanted to redecorate. Ya know a couple throw pillows a T.V. News reporter, what do ya think Leo? Splinter- (coldest lines in the movie) Death comes for us all, Oroku Saki, but when you die it will be...without honor. (SOTO)- The stupid dance sequence. Leo- *whistles* Wishbone crunch on 3!! The Nightclub scene with Tarzan Boy blasting and the feudal guards dancing. TMNT 2014- The elevator scene and the Shredder fight. OOTS- Every time Bepop & Rocksteady say "Mah man!!" for no reason. In the first film, from the point that Raph is thrown into April's apartment through the skylight, up until the campfire scene. The soundtrack during the fight scene, specifically when they are in the antique shop and Casey shows up, is one of my favorite pieces of music all time. It fits the scene perfectly. April looking back at her father's antique shop going down in flames is such a truly heartbreaking moment. Casey & April's interactions on the farm are hilarious and fun. the actual campfire scene is one of the most emotional moments in all of cinema to me. 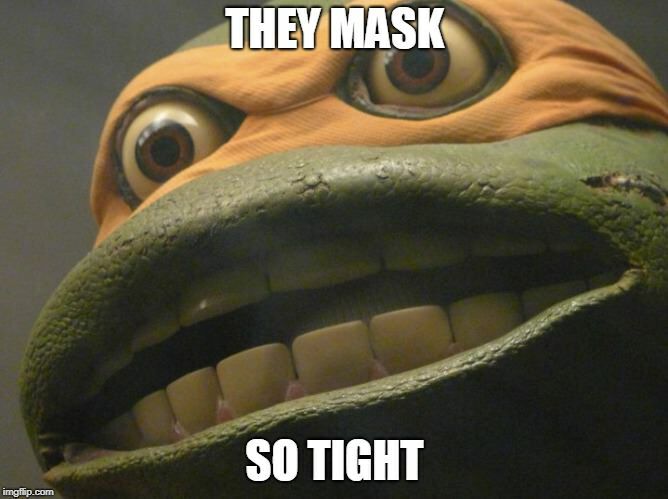 I lose it every time when I see the tear running down Michaelangelo's cheek. I love when one of the turtles calls Casey claustrophobic, when he doesn't want to sleep down in the sewer. Casey gets defensive and replies with something like "What?! I ain't even looked at another guy before"
Hard to pick my favourite movie moment, but the best ones are in TMNT 1990 and TMNT 2007, imo.